Cancellation must take place 2 weeks prior arrival date, should cancellation take place thereafter the first night will not be refunded and 50% of the remaining nights will be charge. Keydeposit on arrival is EUR 10 per key. On arrival the creditcard holder must fill in a damage form completely included creditcard number. In case of any damage to the room/beds we will charge the given creditcard number. INTERNATIONAL BUDGET HOSTEL CITY CENTER is beautifully situated in the heart of the city centre in the Leidseplein (Leidse Square) area. Leidseplein is the most famous nightlife area in Amsterdam. The location of the hostel is on a quiet, beautiful canal - the Leidsegracht. Our hostel, set in a former 17th-century warehouse, has a cozy lounge facing the canal where one can relax and socialize and meet other fellow travellers. The lounge has vending machines, a television. Free Wi-Fi is available in the entire hostel. We are placed in a old monumental building with no elevators, just steep stairs. 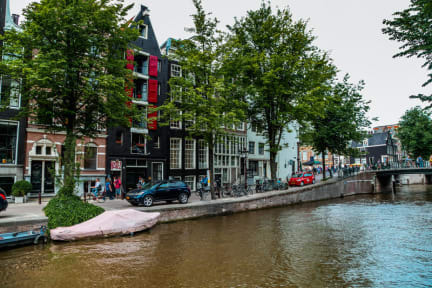 The hostel is a few minutes from the famous Van Gogh Museum, beautiful Dam Square, the entertaining Red light district, relaxing Vondelpark, historical Anne Frank House and the best clubs, coffee shops, bars and restaurants and many more great places. The staff can provide you with great ideas to spend your time in Amsterdam. If you're interested in renting a bike we're happy to organise this for you. There is video security in all public areas. Please read our T&Cs below. The reservation will be terminated if the hostel does not get authorization on the credit card. Reception is open 24 hrs. We slept in a mixed dorm for four. It was a nice stay. The beds were fine and the room was clean. There was enough space for luggage. The location is very nice. The hostel is nearby the Leidse square. A very cozy place. The employees were nice. Be aware of a bail you have to pay to get your roomkey. It's ten euro's or an pasport. They are kind so you get it back. Slechts 1 douche en 2 wc's voor de hele verdieping. Korte bedden. Zeer gehorig. Toen nr 3 wilde douchen was het warme water op. Dik betaald voor een erg matige kamer. Te doen voor 1 nacht. Goede locatie. Wat een kut hostel. Ga er niet naartoe ze naaien je glashard. Ik had de 24ste gereserveerd en zij maken daar de 23ste en zeggen dan zoek het maar uit.